You can submit SQL queries against various data sources from the Drill shell (SQLLine), Drill Web UI, REST API, and tools that connect to Drill via ODBC or JDBC. Drill has several storage and format plugins that enable queries against multiple data sources and data formats, including complex data. The following sections provide some general information about Drill queries. The following query was run before switching to the dfs.schema. A workspace named "samples" was configured in the dfs storage plugin, creating a schema named dfs.samples. Notice that you have to use dot notation for the schema and back ticks around the table name. In some cases you may point to a directory or file in the schema, in which case you would put back ticks around the entire path, for example dfs.samples.`/nation/data/nation.parquet/`. In some cases, Drill converts schema-less data to correctly-typed data implicitly. In this case, you do not need to cast the data to another type. The file format of the data and the nature of your query determines the requirement for casting or converting. Differences in casting depend on the data source. For example, you have to cast a string "100" in a JSON file to an integer in order to apply a math function or an aggregate function. 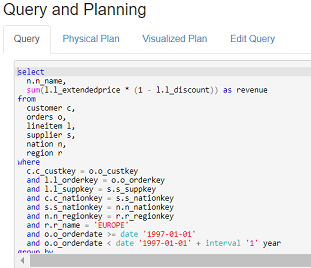 To query HBase data using Drill, convert every column of an HBase table to/from byte arrays from/to an SQL data type as described in the section "Querying HBase". Use CONVERT_TO or CONVERT_FROM functions to perform conversions of HBase data. In addition to analyzing error messages printed by the Drill shell, you can troubleshoot queries from the Profiles page in the Drill Web UI or run the EXPLAIN command to review the query plan for issues. For example, if you run into a casting error, the query plan text may help you isolate the problem. Drill shell commands include the !set <set variable> <value> to increase the default text display (number of characters). By default, most of the plan output is hidden. Include a semicolon at the end of SQL statements, except when you issue a Drill shell command. When selecting all (SELECT *) schema-less data, the order of returned columns might differ from the stored order and might vary from query to query. Drill 1.13 extends the syntax highlighting feature for storage plugin configurations to queries. The Edit Query tab auto-populates with the query so you can easily edit and rerun a query. In addition to syntax highlighting, an autocomplete feature enables you to use snippets (SQL templates) to quickly write syntax for queries. 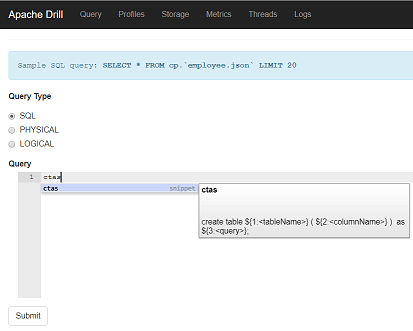 On the Query page in the Drill Web UI, place your cursor in the Query window and press ctrl+space. A drop-down menu of Drill keywords, functions, and templates appears. Use the up and down arrows on the keyboard to scroll through the list. Note: The s* option provides the template for a SELECT query.